Genervon discovered the endogenous multi-target embryonic stage master regulator for the development, monitoring and repair/restore the homeostasis condition of the human nervous system. Phase 1 safety clinical trial showed that GM6 is a very safe and tolerable small peptide drug. Phase 2A clinical trial showed statistical trend in clinical and biomarkers data. Genervon has the ALS patient clinical efficacious data on GM6 modulating TDP43 back to normal range by reducing TDP43 accumulation and cyoplasmic mislocalization. 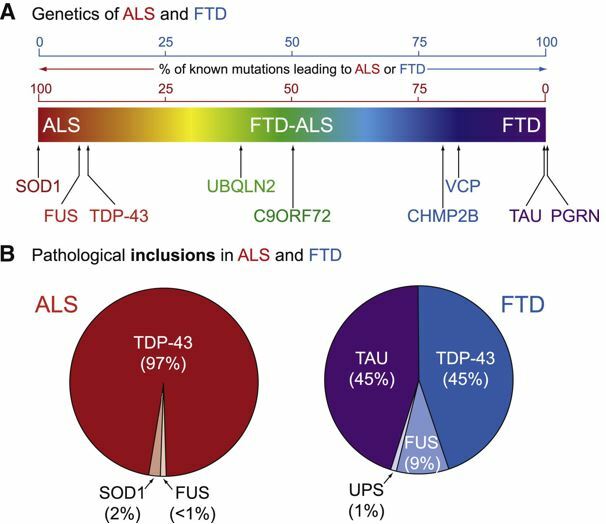 TDP43 is but one of many genes and misfolded proteins that can caused the pathological disorders of ALS. French neurologist Jean-Martin Charcot discovered the ALS disease in 1869. In the 147 years since the identification of the disease ALS, no drug-based treatment nor cure has been found. This is not surprising, since ALS is very heterogeneous meaning that the triggers of the disease seem to be random though all ALS patients have the same end results, the death of motoneurons and neurons. Genervon's hypothesis is that ALS cannot be cured by a single drug (or a cocktail of single target drugs) as evidenced by the uniform failure of the single target drugs tested in over 170 ALS clinical trials. Genervon discovered Motoneuronotrophic Factor (MNTF) and identified a family of nine endogenous analogs. GM6 was chosen as a multiple-target nontoxic and safe peptide drug for neurological and neurodegenerative diseases and can pass through the Blood Brain Barrier. GM6 is an endogenous embryonic stage master regulator of the human nervous system. GM6 binds specifically and only to the beta sub-unit of the tyrosine kinase of the Insulin Receptor, IGF1R and IGF2R. The observed effects of GM604, named for ALS indication on TDP-43, SOD1 and Cystatin C are consistent with the Neuroprotective properties of GM604 reported in previous Genervon's PCR studies of GM604 with SHSY5Y cells which can be used as supportive data for Genervon's hypothesis that GM6 is a master regulator that modulates ALS disease by responding to distress signals from multiple affected genes to a normal range and brings homeostasis of affected biological systems. Plasma TDP-43 was reduced 30% below baseline at week 12. The slope from baseline to week 12 were -3.513 and 0.493 for GM604 treated group and placebo group respectively, p=0.0078. Significant differences in percentage change between the GM604 treated and placebo patients were observed in Plasma Total Tau at 6 weeks (p=0.0369) and SOD1 plasma at 2 weeks (p=0.055). In the pre-specified analysis on FVC, statistically significant differences were observed in change from baseline to week 12 when comparing treatment with placebo using data from one treatment center (-28 vs -4.8, p=0.0268). ALSFRS-R is a disease specific subjective functional PRO. The sponsor measured the slope of ALSFRS-R decline before and after treatment. It was found that the slope for the active treatment changed had a 30% decrease in slope compared to before the treatment. The ALSFRS-R slope per month was also compared to a historical placebo control with definite ALS patients of the Ceftriaxone trial showing a statistical significant difference (-0.99 vs -1.97, p=0.0047). The results of Genervon's Phase 2A clinical trial of GM604 in ALS patients indicated that GM604 can modulate multiple protein biomarkers (including TDP-43) back to their normal ranges, thus restoring homeostasis. The reduction of TDP43 prevent the formation of toxic plague which were formed in the brain of 97% of ALS patients. Genervon has data from human trials showing that GM604 reduces the over expression of TDP-43 restoring its function of preventing many cells from using unwanted genetic information to make misfolded proteins. Genervon received (in May 2015) the latest patient TDP43 biomarker data analysis for its treatment of this late stage patient (over 10 years quadriplegic ALS patient on ventilator. See link from Professor Robert Bowser, the Director of Genervon's Biomarker CRO Iron Horse Diagnostic Laboratory. Genervon was surprised that the patient's plasma TDP-43 10 years after the onset of ALS was 144.54 pg/ml at baseline, as high as those of all the ALS patients in the phase 2A GALS001 trial (whose mean was 138.88 pg/ml within 2 years of ALS onset). The normal range of TDP-43 in plasma is 0-50 pg/ml. At the end of two weeks of treatment (six doses) with GM604 the value was 92.59 pg/ml and at the end of 12 weeks it was 52.53 pg/ml. The percentage reduction of TDP43 from baseline in this unique patient was 63% in 12 weeks. At 12 weeks, the mean percentage change in TDP-43 in the treated GALS001 patient group was -34% and the mean percentage change in the placebo patient group was +6%. GM604 significantly reduced the slope of plasma TDP-43 concentration at 12 weeks when compared with a placebo (p=0.0078). 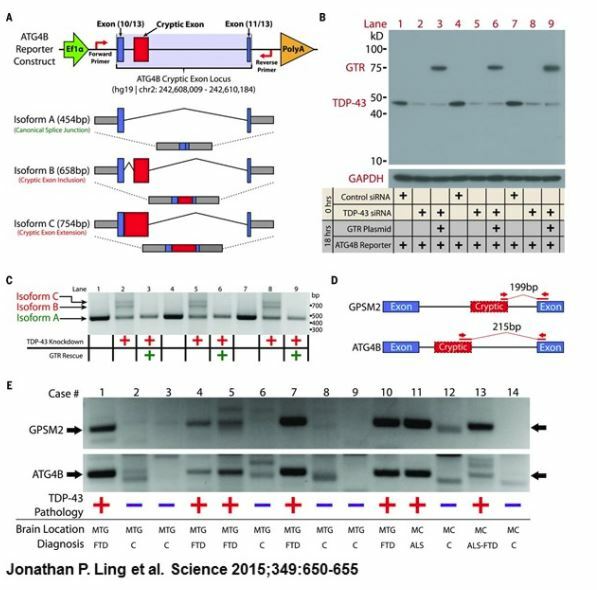 Dr. Philip Wong of Johns Hopkins published a paper in Science (August, 2015, 349:650-655) demonstrating that TDP43 regulates the splicing of conserved exons and represses the splicing of nonconserved cryptic exons, maintaining intron integrity. Lifting the breaks on cryptic exons because of the aggregation of the over expressed TDP43 allows random nonconserved exons to be spliced into messenger RNAs and produced random defective misfolded proteins triggering different neurological deficit cascades that lead to the death of neurons including motoneurons in the brain and spinal cord cells. Dr. Wong showed that TDP-43 is normally responsible for keeping unwanted stretches of the genetic material RNA, called cryptic exons, from being used by nerve cells to make proteins. However, when TDP-43 forms aggregates inside those cells, it malfunctions, allowing the cryptic exons to be used by the nerve cells to make proteins, resulting in the production of random defective proteins triggering a neurological cascade of events that kills brain or spinal cord cells. This may be the source of the heterogeneous pathology of ALS. Dr. Inoue of Kyoto University demonstrated that the neurites in purified iPSC-derived motor neurons from ALS patients are shorter than from healthy subjects. TDP-43 spreads out from the nucleus to the cytoplasm, forms aggregation and becomes toxic, causing the death of motor neurons. As TDP-43 mRNA levels decreased, the death of neurons was prevented and the previously short projection of nerves became longer. Therefore, a slowing of ALS disease progression is expected. Source Link. (A) ALS iPSC-derived HB9:: GFP-positive motor neurons are shown before and after sorting by FACS. (Lower panels) Representative images of purified ALS and control iPSC-derived motor neurons. Scale bars, 10 mm. (B) The length of neurites was measured in purified ALS and control iPSC-derived motor neurons. P =2.0 x 10-4 by t test. Error bars are SEM. Dr. Virginia Lee of the University of Pennsylvania School of Medicine has provided critical evidence that the aggregation of brain proteins is a common mechanistic theme in diverse neurodegenerative diseases, including AD, PD, FTD, ALS and related disorders. In an estimated 97 percent of people with ALS/MND and in 45 percent of those with Alzheimer/FTD, the pathological protein TDP-43 was found to be aggregated inside brain or nerve cells. Fig. 2. Phenotypes of ALS iPSC-derived motor neurons. Source Link. The about and other scientists established evidence for the possibility that the heterogeneous nature of ALS is due to the malfunction of the biomarker TDP-43. Classical single target drugs are mono-directional: agonist or antagonist. Genervon's hypothesis is that the endogenous signaling master regulator GM6 can restore health by regulating/modifying multiple genes and their protein expressions in the correct direction when they are above or below the normal range. This hypothesis has been difficult to prove, as most ALS patients are uniformly above or below the normal ranges for most CSF biomarkers. However, the GALS-C patient is unusual, having survived 10 years when the average life expectancy is 3 to 5 years. His biomarkers were below the normal range whereas the GALS001 patients' biomarkers were above and GM6 regulated both in the correct direction towards the normal range/level, the hallmark of homeostatic processes in healthy living organisms. "This is definite evidence that GM6 is as a potent master regulator of neuronal homeostasis," said Ko. Several professional rugby athletes who have recently been treated using GM604 may have been exposed to pesticides applied to playing fields. Some of them have the habit of licking their fingers to get a better grip on the ball. In the absence of functioning TDP-43, toxic pesticides and harmful chemicals may act as random segments of RNA and splice themselves into the messenger RNAs during protein formation to create faulty/misfolded proteins within cells causing the neural cells to die. A study conducted on the Italian national soccer team showed that its players were six times more likely than the general population to contract ALS - and within that group the players who had longest careers were most likely to have the disease. An NFL-funded study found that ALS was four times more prevalent in its players than in the general population and interestingly more prevalent among those playing offense than those playing defense. Genervon applauds the game changing basic science research paper recently published by Professor Jeffrey Rothstein (Science, September 2015) on a gene mutation known as C9orf72.